Will Japanese Exposed To Low-Dose Radiation In The Aftermath of Fukushima Nuclear Plant Catastrophe End Up Living Longer? 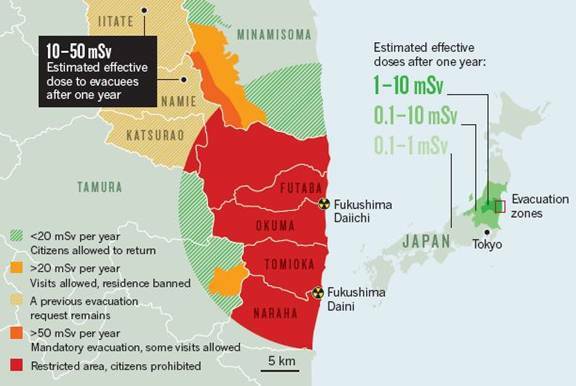 Given new understandings in radiation biology, there is a real possibility that people in Japan exposed to low-dose nuclear radiation in a geographical perimeter outside of the immediate area of radiation leakage near Fukushima, Japan will actually live longer and healthier lives. This pre-drawn conclusion is made in the light of recently published studies that confirm the biological phenomenon known as hormesis, explained as exposure to mild biological threats that trigger the body’s internal antioxidant defenses and speed repair of damaged DNA. This is a follow-up report pertaining to human nuclear radiation health hazards posed by the tsunami/earthquake-induced nuclear plant radiation leaks in Fukushima, Japan which I first reported in March of 2011. There is now evidence from WWII atomic bomb survival data in Japan that exposure to low-dose nuclear radiation actually decreases the risk for cancer. There is also newly published data from animal experiments showing low-dose radiation exposure, typical to what a human would receive from a screening x-ray for lung cancer, may actually activate the body’s defenses against cancer, which corroborates with the observed decrease in human lung cancer mortality reported by The National Lung Screening Trial Research Team study. Another recently-published animal study also corroborates the idea that low-dose radiation exposure may reduce cancer risk. A recent experiment shows when laboratory animals are exposed to low-dose gamma radiation in addition to cancer-causing tobacco smoke this significantly inhibits the development of lung cancer. Another remarkable recent discovery coming from the animal lab reveals that low-dose radiation increases a key protective antioxidant by 563% and is therapeutic in an animal model of progressive irreversible night blindness (retinitis pigmentosa). Also, researchers in Poland note that healthcare workers, often exposed to low-dose radiation in the workplace, are actually healthier. It is interesting fact to note is that in high-altitude mountainous areas where terrestrial (radon), solar (ultraviolet) and atmospheric (gamma) radiation are believed to be responsible for the lower cancer mortality rate observed at high-altitude versus low-altitude areas. How much radiation produces hormesis? We now have accurate measure of the amount of radiation exposure to human populations in Japan. As David Brenner, a radiation biophysicist at Columbia University in New York, explains, a dose of 5 mSv would be estimated to lead to one excess cancer per 5,000 people exposed. Given that roughly 2,000 of those 5,000 people are going to develop cancer anyway, this is a tiny increase in risk, and Brenner emphasizes that the uncertainties in his calculations are high. But that radiation exposure levels and subsequent future cancer cases were over-estimated may not be the biggest part of the story emanating from Fukushima. In light of the hormesis effect produced by low-dose radiation exposure, advocates of radiation hormesis suggest there is no evidence that exposure up to 5 millisieverts/year produces adverse effects in the short or long term. But hormesis isn’t limited to protection against cancer and other diseases, it suggests a powerful up-regulation of antioxidant defenses that should produce exceptional health and longevity. Indeed, laboratory mice continually exposed to low-dose radiation experience increased lifespan. Indeed, low dose radiation has been shown in the laboratory to stimulate stem cell growth, something that is absolutely required for repair of damaged tissues. Biologists now recognize there are an array of biological stressors (food deprivation or calorie restriction, low-dose radiation, high-altitude low-oxygen environments) that are now recognized as hormetic agents. Activation of hormesis strongly implies accompanying health and longevity in human populations. Biologists have now identified the actual gene (Nrf2) pathway that activates protective internal antioxidants (hormesis) as well as the natural molecules that activate this gene pathway (resveratrol, curcumin, green tea), which by the way are only protective at low dose (but above dietary intake levels). Investigators are now saying it may be time to utilize hormesis to prolong the quality and quantity of human life. The fact that it has taken decades for modern medicine to recognize hormesis suggests only if modern medicine can find a way earn greater financial rewards would hormesis ever be practiced in the medical clinic. This suggests the public must not anticipate guided instruction from health professionals (even alternative medicine doctors) regarding this powerful force known as hormesis and should be urged to step forward and implement hormesis by a variety of known methods (modest wine consumption, limited calorie diets, or molecular mimics of the same (resveratrol, other polyphenols). © 2013 Bill Sardi, Knowledge of Health, Inc.